President Cyril Ramaphosa says state-owned "land parcels" have been identified for the purpose of expropriation without compensation. Ramaphosa delivered his 2019 State of the Nation Address on Thursday. Addressing land reform, Ramaphosa said an advisory panel would submit an important report to his office before the end of March. "An advisory panel of experts headed by Dr Vuyo Mahlathi, established to advise government on its land reform programme, is expected to table its report by the end of March 2019. "As part of accelerating land reform, we have identified land parcels owned by the state for redistribution. "Strategically located land will be released to address human settlement needs in urban and peri-urban areas," he said to applause from those in the House. 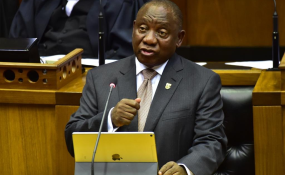 Ramaphosa also commended the public and legislators for their role in last year's parliamentary process looking into the debate around amending the Constitution to allow for expropriation without compensation. "I wish to commend the many South Africans who participated in the work of the constitutional review committee in the dialogue that ensued through the length and the breadth of the country. "I applaud the members of the constitutional review committee for remaining focused throughout this period and sifting through the submissions that were made by ordinary South Africans and their organisations. "We will support the work of the constitutional review committee tasked with the review of section 25 of the Constitution to unambiguously set out provisions for expropriation of land without compensation." With regards to an agriculture stimulus package, Ramaphosa said government had invested significantly in comprehensive farmer development support to ensure that restituted and communal land was productively used. Government would continue to prioritise targeted skills development and capacity building programmes for emerging black farmers.